Could you use a dumpster at your house? I see big dumpsters at people’s homes a lot here lately as roofs are being replaced or inside of homes are being remodeled. People need something bigger than a normal trash can to get rid of the junk and the trash. If I had a dumpster at my house, I would just start decluttering my home. I am trying to do that one room at a time right now but if I had a dumpster, I would do it faster. Why? Because it’s bigger than a little trash can and it makes me want to fill it up with all the trash and junk I don’t want anymore. I think about how much unwanted things I have in my house. A lot of things I thought I needed but don’t or things I have been hanging onto because it was easier to keep than to deal with. It’s so freeing to declutter. Whether it’s a room or a car or a purse, there is just something freeing about getting all the trash and junk out to be able to enjoy and live a little lighter. That’s what Jesus tells us about the junk, the trash, the baggage we are hanging on to in our own lives. The devil wants us to think we need to keep that sin in our lives, that shame, that hurt, that unforgiveness…that baggage and trash. But Jesus said to let it go and believe that He loves you no matter what. It’s time to put the junk in the dumpster. Jesus tells us in John 8:32 – then you will know the truth and the truth will set you free. The truth is that Jesus removes junk, forgives and loves us forever. 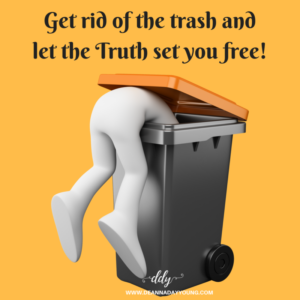 Fill up the dumpster with all that junk and live free in knowing the truth of Jesus. And NO DUMPSTER DIVING to go back and get it. Once He takes it, He keeps it and doesn’t ever want you to have that junk again. Happy Decluttering! 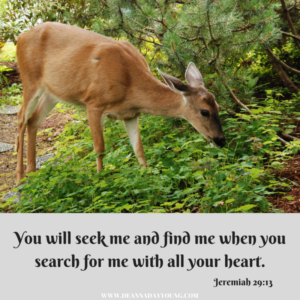 This entry was posted in devotional, inspirational, motivational, spiritual on June 30, 2018 by Deanna Young. I was sitting on my couch one evening and a movement in my backyard caught my eye. You know how you see something out of the corner of your eye and it startles you? You weren’t expecting it but when you look up it’s a pleasant surprise. She was walking along the path of the field and our yard into the freshly mowed edge of the woods. My husband had just taken the tractor with the large mower blade deeper into the woods to create this beautiful path that seemed to lead to a small paradise of peace. She was leisurely taking that path. I was so excited to see her. Just beautiful. She was taking her time and I patiently watched her every move. I couldn’t wait to see what she was going to do next. Every morning when I get up as the sun is rising, I open the patio blinds to see if I can see her. Most every evening, I sit on my glider on the back porch very quietly awaiting her return. My husband and I sat a long while over the weekend just gliding and gazing toward the woods hoping to see a glimpse of her. We can see evidence she is still there – footprints, mangled bean pods, wrestled sticks and patted down grass. We know she’s still there even though we don’t see her every day. I wish I was so calm and patient with God’s appearance. Wouldn’t it be great to get as excited to get up each morning and each evening and just wait patiently to see God work? I wish I had as much faith in seeing Him answer prayers as I do in seeing that deer reappear. But if only we would look around! We can see His footprints in our everyday life. We can see where He’s been and sometimes a path to where He is going. We don’t know when our situation will get better or when He will work again but we have promises that He is working everyday in every situation to bring good to us and honor and glory to Him. Let’s look around today and see if we can see Him at work. And if it doesn’t seem obvious, then let’s look around for His footprints and wrestling of sticks that lay in our path. I guarantee that He’s here with us. We just have to be aware to catch that glimpse out of the corner of our eye. This entry was posted in devotional, inspirational, motivational, spiritual on June 26, 2018 by Deanna Young. The Weight of a Balloon And the Joy of Release! Balloons! I just can’t help but smile when I see them. They seem to be a symbol of celebration. It’s always fun to watch balloons go up in the sky as if giving a celebration gift to Jesus. As a kid, I used to love letting those balloons go and I’ve found that a few years and added aches and pains of age hasn’t taken away the excitement of letting those circles of air head up to the sky. We’ve used balloons to write messages on to send to heaven. We released balloons at Y2K to celebrate a new century. And just a couple of weeks ago, survivors and caregivers released balloons to celebrate life. I am thankful my parents are two of those who were honored to join the survivor celebration. Wow! Giving our worries up to the Lord is like sending a balloon up to heaven. But what is hard to understand is that our worries are more like cement blocks to us that won’t fly. That’s where trusting Him takes over our understanding. If we can just let go of that string and let all those worries float to Christ, then our burdens are lifted and our peace restored. Whether we do it virtually or physically, let’s let go of the worries we are holding by the string today and give them to God. In exchange, we will find a weight lifted and a peace and joy restored. 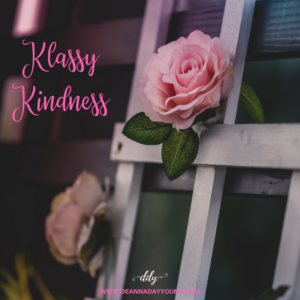 This entry was posted in devotional, inspirational, motivational, spiritual on June 19, 2018 by Deanna Young.